Posted on Monday, April 16, 2018 by "T". Bertrand Grospellier, better known in the poker world as ElkY, has joined partypoker as the latest ambassador. 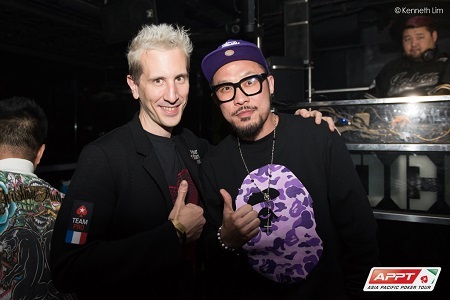 ElkY joins an elite team of ambassadors including Isaac Haxton, Fedor Holz, Sam Trickett, Patrick Leonard and Jason Koon, amongst others, and will not only assist with the launch of partypoker.eu but will also help facilitate effective communication channels between partypoker and the poker community. "ElkY" Becomes Hearthstone Sponsored Pro! Posted on Monday, November 16, 2015 by "T". 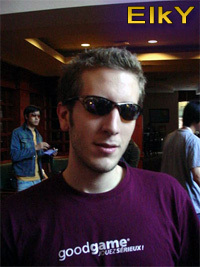 Bertrand "ElkY" Grospellier was one of the top ranked StarCraft players in the world before beginning the transition to poker in the end of 2003. 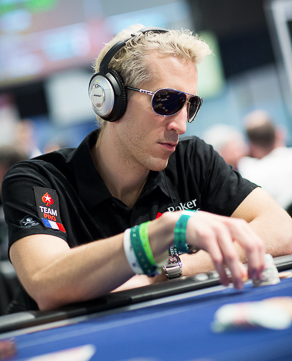 ElkY has been under the Team PokerStars Pro flag since 2006 and accumulated almost $11 million from playing live tournaments! Read more » "ElkY" Becomes Hearthstone Sponsored Pro! LIVE STREAM: $130,000 buy-in GuangDong Ltd Asia Millions begins today! Posted on Wednesday, June 05, 2013 by "T". It's not only in Vegas that big sums of money are at stake at the moment, because today a HKD 1 million buy-in (approx. USD$130k) tournament kicks off in Macau, China. Guangdong Ltd Asia Millions (2 re-buys maximum) is hosted by PokerStars Live at the City of Dreams (PokerStars LIVE Macau) and will run until June 7, 2013, with live streams. Chinese businessman and several well known poker pros (Gus Hansen, Isaac Haxton, ElkY, Jonathan Duhamel, Erik Seidel and a few others) are due to attend the event, which is expected to become one of the biggest high roller events in history! START TIME: 15:00 local time in Macau (GMT +8) from level 9 approx. START TIME: 15:00 local time in Macau (GMT +8) from level 1 approx. Read more » LIVE STREAM: $130,000 buy-in GuangDong Ltd Asia Millions begins today! Posted on Monday, March 11, 2013 by "T". Posted on Thursday, February 28, 2013 by "T". It seems like there will be a challenge between Team PokerStars Pro and Full Tilt Poker's The Professionals at the the 2013 EPT London (March 5-16). 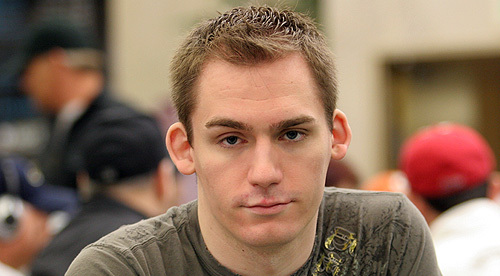 It started last week with Gus Hansen sending a Tweet to Daniel Negreanu reminding him of a classic hand they played on High Stakes Poker in 2006. Posted on Friday, February 08, 2013 by "T". The High Roller (buy-in €10,000+€300) kicked off yesterday with 71 players (plus 14 €10k rebuys). There were a lot of familiar faces in the field: Eugene Katchalov, Bertrand "ElkY" Grospellier (picture), Michael Tureniec, Steve O'Dwyer, Kevin MacPhee etc. Posted on Tuesday, October 02, 2012 by "T". There are now 77 remaining players of 420 in the WSOP Europe Main Event. Michael Mizrachi held a significant lead over his next closest competitor, Day 1b chip leader Bertrand "ElkY" Grospellier when Day 2 started. "The Grinder" played loose-aggressive game that took him, and his opponents, for a wild rollercoaster ride. Eventually he was eliminated in in Level 11 where he joined Vanessa Rousso, Joe Hachem, Phil Ivey, Antonio Esfandiari and many other big names on the rail. Posted on Monday, October 01, 2012 by "T". The two starting days of the WSOP Europe Main Event are in the books now. In total, 420 players enterd the tournament for €10,450 each and created a massive €4,032,000 prize pool. Today the second day of the tournament will be played and 230 players have chips left. Posted on Thursday, September 27, 2012 by "T". Event #5: €10,450 Mixed Max (nine handed on Day 1; six handed on Day 2; and then heads-up for the final 16) kicked off yesterday with 96 players. After eight levels of play, 52 of them had chips left and Jennifer Tilly had the largest pile of chips in front of her. In total, she accumulated an amazing 218,500 chips during the day - about 90k more than her closest opponent, Faraz Jaka. 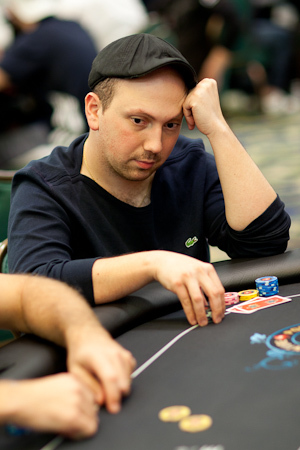 Apart from Jaka and Tilly, big names such as Marvin Rettenmair (109k), Michael Mizrachi (89,7k) and Bertrand "ElkY" Grospellier (82,5k) finished Day 1 with plenty of chips as well. Day 2 of the tournament starts later today and it will defintely be a very exciting day of poker because only 16 of the remaining players will receive their share of the €921,600 prize pool. The winner will take home €258,047 while the runner-up will get €159,459. We will be back with another update tomorrow morning. 2012 SCOOP #6-High: "ElkY" and "KidPoker" made it to the final table! In ended up being a very exciting final table in the Spring Championship of Online Poker #6-High ($1,050 NL Draw) event as both Daniel "KidPoker" Negreanu and Bertrand "ElkY" Grospellier were on it. Both of them did extremely well on the final. ElkY, however, was sent packing in 3rd place for $11,530,00, which left Daniel Negreanu playing heads-up against Argentian pro Roberto "Maestro Shao" Greco. Negreanu, who has reached several final tables both online and live this year but failed to win, didn't win this time either and instead it was Roberto Greco who laid hands on the title and the first prize of $22,890. Negreanu received $15,330 for his efforts. Posted on Friday, May 04, 2012 by "T". Bertrand "ElkY" Grospellier is back in first place on Global Poker Index thanks to his third-place finish in the €100,000 Super High Roller that was played during EPT Monte-Carlo. Jason Mercier, who had the lead last week, has now dropped to second place. 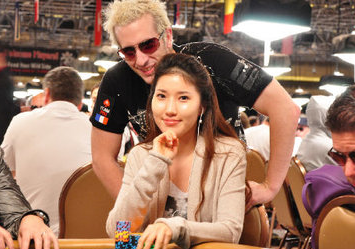 This is the first time since December last year that ElkY is back in the lead on GPI's list. However, it extremely tight among the top players, so we might see a change already next week. Posted on Wednesday, April 25, 2012 by "T". The final table of the first-ever EPT Monaco Super High Roller was set last night with the following 8 players. EPT Berlin Day 1b: Local takes overall lead! Posted on Wednesday, April 18, 2012 by "T". The second starting day of the EPT Berlin main event saw a field of 502 players, more than twice the amount of players that played Day 1a. Cengiz Ulusu, from Germany, finished the day as the chip leader with a massive 242,800 chips - just about 40k more than Vladimir Geshkenbein's 201,600 from Day 1a. Ulusu is no stranger to success when it comes to the European Poker Tour in Germany. In 2009, before EPT Berlin was born, he made it to the EPT Dortmund final table and finished 8 - after he let a coin decided whether or not he should make a big call. Unfortunately the wrong side came up and he called and lost the pot. Read more » EPT Berlin Day 1b: Local takes overall lead! Posted on Wednesday, March 07, 2012 by "T". The second starting day of WPT Bay 101 Shooting Star attracted a field of 222 players. The day ended with Christ Summers as chip leader (188,000) and Taylor von Kriegenbergh in second place with 181,300. Summers and Kriegenbergh played outstanding poker throughout the day and it will be interesting to follow theme during Day 2. Posted on Friday, January 13, 2012 by "T". 141 players paid $25k each and entered the PCA High Roller event yesterday. Seven of these 141 players even re-entered the tournament for another $25,000 ("ElkY", Chris Moorman, Chance Kornuth, Eui Woong Kim, Joe Elpayaa, and Nick Yunis)., making the total number of entries 148 - 10 less than last year. After 11 levels of play, lots of all ins, bad beats etc, 56 players remained and they will return to the tables today and continue the struggle towards the juicy $1,134,930 first prize. Chip leader is Nick Yunis from Chile with about 60k more than his closest opponent, businessman Bill Perkins. Yunis has been around the poker scene for a couple of years but missed out on the really big cashes. So, now he has a great opportunity to do something about that. Posted on Tuesday, November 29, 2011 by "T". It ended up being a very interesting final table of the WPT Marrakech main event since 3 PokerStars Pros, Arnaud Mattern, Jonathan Duhamel and "ElkY", were on it. However, neither of them stood a chance against the native Mohamed Ali Houssam. Houssam, the Day 1 chip leader, played fantastic poker on the final table and always seemed to be one step ahead of his opponents. He also managed to keep a cool head when the cards weren't on his side, and also when he made a bad play... and it really paid off! 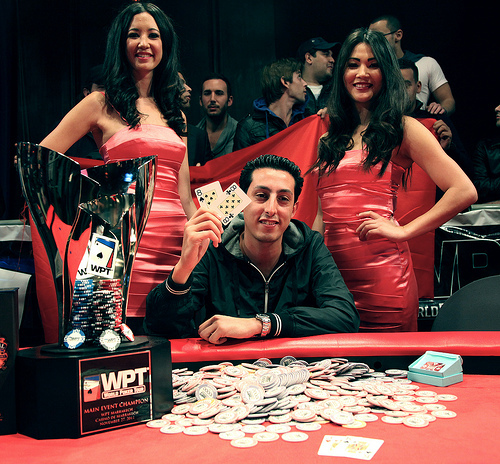 For the win of WPT Marrakech he received a first price of amazing $267,011 - the biggest cash in his entire poker career! "ElkY" didn't stand a chance against "RaSZi"
Posted on Wednesday, November 23, 2011 by "T". Yesterday the long-awaited kickboxing match between PokerStars Pros Lex "RaSZi" Veldhuis, from Holland, and Bertrand "ElkY" Grospellier, from France, took place. The 27-year-old Dutchman had a lot more experience in kickboxing and took the command straight away. ElkY survived the first round, but a bit into the second round he got a kicked in the face and fell to the floor. He managed to get up again for a few minutes before Veldhuis kicked him down once again. Posted on Friday, November 11, 2011 by "T". Global Poker Index released a new list of the top 300 tournament poker players the other day. GPI used a formula that takes a player's result over the six half-year periods . Erik Seidel, as usual, holds the the Number 1 position, and close behind him are Bertrand "ElkY" Grospellier and Jason Mercier. EPT Monte Carlo: The High Roller event is on! Posted on Friday, April 30, 2010 by "T". 113 players paid the buy-in of €25,000 and entered the High Roller Event at EPT Monte Carlo. As you can imagine there were quite a few notables! 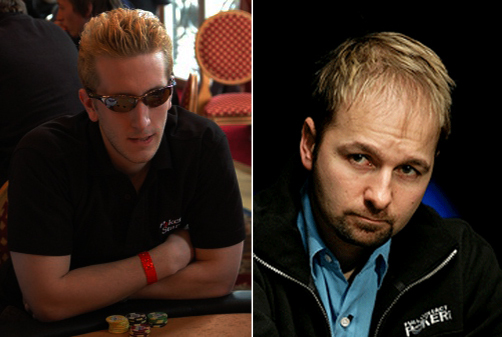 Just to mention a few,Gus Hansen, Tony G, Barry Greenstein, Jason Mercier, Daniel Negreanu and Vanessa Rousso. Anyhow, Day 1 of the High Roller Event has now passed. 41 players will return today to play Day 2 of the tournament. Among these players we find notables such as ElkY, Gus Hansen, Tony G, Sorel Mizzi etc. In the chip lead is Tobias Reinkemeier (457,300) with Luke Scwartz (300,500) and Markus Goiser (291,000) close behind. The total prize pool is €2,825,000. In other words, lots of money up for grabs! But these guys are used to these kind amounts, so they will for sure treat this tournament just like any other major tournament and play their game. Posted on Tuesday, January 12, 2010 by "T". 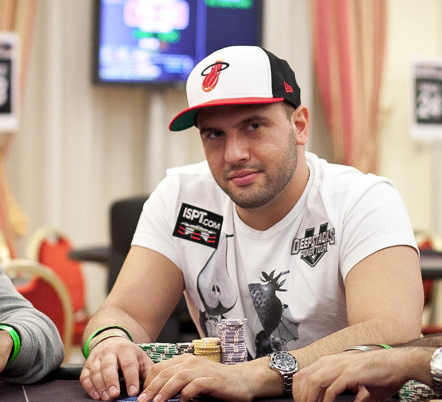 The Italian PokerStars pro Dario Minieri has taken the lead with 218,600 chips in the PCA High Roller event in Bahamas. Minieri is clossly followed by two players - Lex Veldhuis (214,500) from Holland and Dmitry Stelmak from Russia (203,400). 52 out of 85 players will return to play Day 2 of the tournament. Elky, The Team PokerStars Pro who won last year's High Roller event only has 7200 chips left and is in last place of the remaining 52 players. Elky needs to double up a few times in the beginning of Day 2, because otherwise the blinds (400/800 blinds + 100 ante) will eat up his stack in no-time. 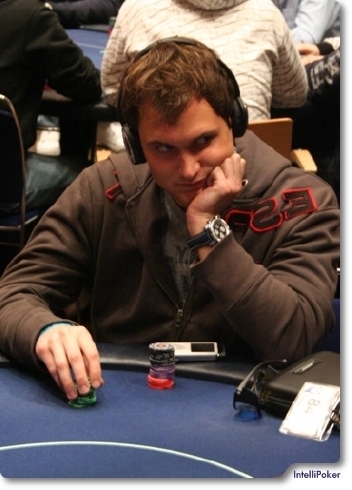 Play with Dario Minieri, Elky and other poker pros at PokerStars. We will give you a 100% up to $600 bonus on your first deposit. Posted on Friday, August 28, 2009 by "T". The third season of APPT Macua attracted 429 players who created a total prize pool of HKD $16,130,400 (2,081,092 US Dollars). All three starting days have now been played. First day saw a starting field of 119 players and 60 of them made it to Day2. Day 1b attracted 125 players, 55 of them made it through to Day 2. Day 1c saw the biggest starting field of all 3 starting days. Not less than 185 players took part this day. Day 1c also included the most notable names. PokerStars Team Australia Pros Joe Hachem (Winner 2005 WSOP main event), Tony Hachem (Runner-up 2007 NZ Poker Championships) and Lee Nelson (2006 Aussie Millions Champion), Bertrand (ElkY) Grospellier (Winner 2008 PokerStars Caribbean Adventure) from PokerStars Team Pro: France, PokerStars Team Asia Pros Celina Lin (Winner Macau Poker Cup: Red Dragon July 2009) and Bryan Huang (Third 2008 APPT Macau Main Event) all of them move forward from Day 1c to Day 2. Out of 429 players, 196 players made it through to Day 2 of APPT Macua. The ones that will bring the most chips with them to Day 2 all come from Day 1b - Kristoffer Myhre from Norway (183,400), Peter Nielsen from Denmark (141,500), and PokerStars online qualifier Roel Pijepers from Netherlands (125,500). Posted on Thursday, August 27, 2009 by "T". Day 1b of APPT Macau attracted a starting field of 125 players. Of these 125 players, 55 made it through to 2 Day of the tournament. 22 of these are PokerStars online qualifiers and 5 PokerStars Macau satellite winners. The ones that will bring the most chips with them to Day 2 from Day 1b are Kristoffer Myhre from Norway (183,400), Peter Nielsen from Denmark (141,500), and PokerStars online qualifier Roel Pijepers from Netherlands (125,500). Day 1c of the tournament will include a lot of familiar names. Joe Hachem (WSOP 2005 main event winner), Tony Hachem (Runner-up 2007 NZ Poker Championships), Bertrand "Elky" Gospellier (Winner of 2008 PokerStars Caribbean Adventure and much more), Lee Nelson (2006 Aussie Millions Champion) any many more. Day 1c will for sure be the most interesting and action filled day so far of the tournament! Posted on Wednesday, April 29, 2009 by "M". During day 1a of the EPT Grand Final a lot of attention was given to the jumbo screen where the final table would later be broadcasted. In the middle of the spotlight Bertrand "ElkY" Grosspellier was sitting and playing online poker at PokerStars trying to break the world record for the number of SNGs played during an hour. In order to break the record he would have to end the session with a profit or the attempt would not count. Posted on Thursday, January 08, 2009 by "T". Tonight's final table in the $25k High Roller tournament includes 8 players fighting for a first price of $433 500. 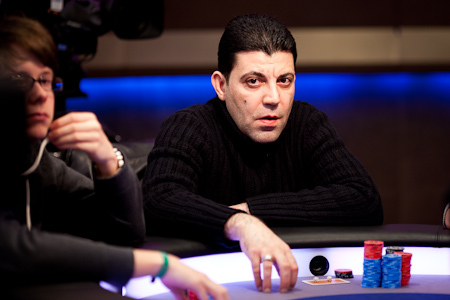 On the final table we find many interesting poker players, such as Humberto Brenes and Daniel Alaei for example. But probably the most interesting player to follow will be Bertrand "ElkY" Grospellier who won both a World Poker Tour (WPT) and a European Poker Tour (EPT).